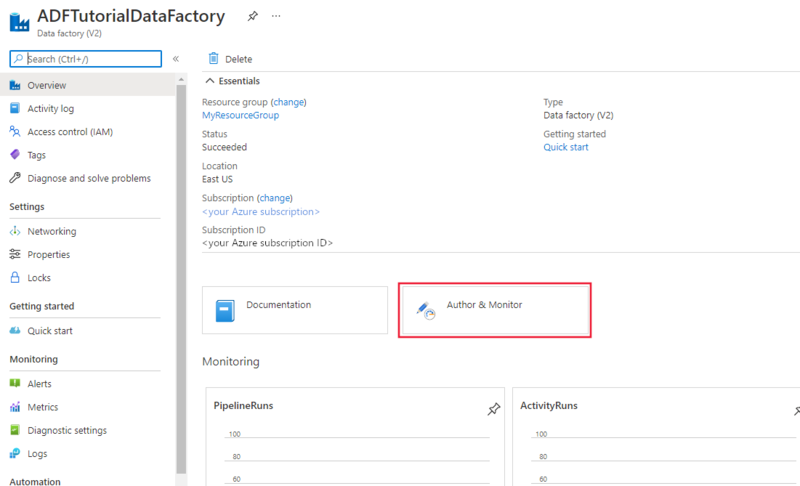 This quickstart describes how to use the Azure Data Factory UI to create and monitor a data factory. 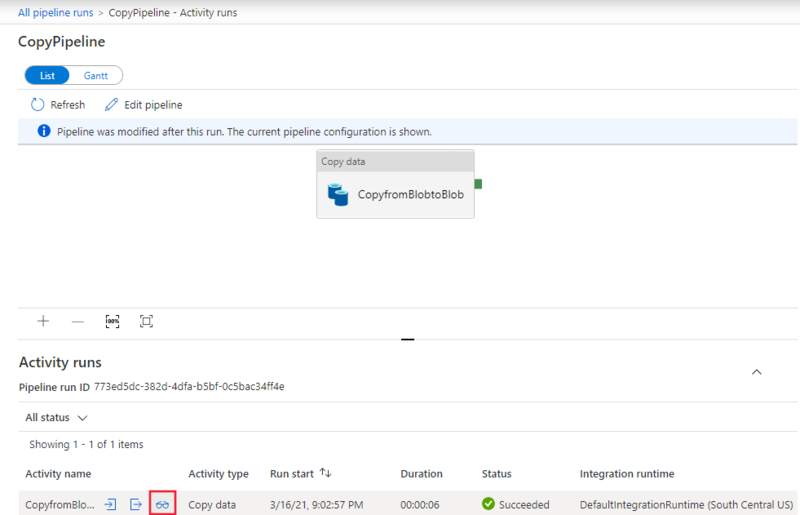 The pipeline that you create in this data factory copies data from one folder to another folder in Azure Blob storage. 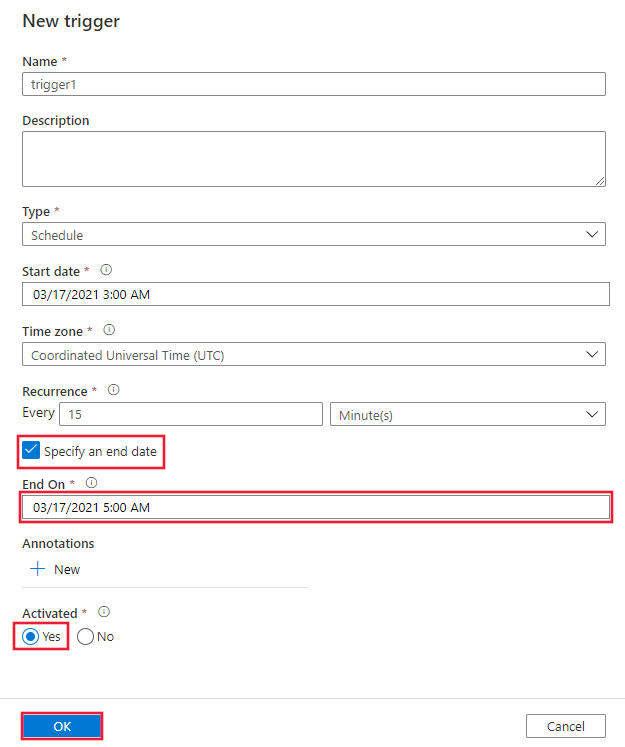 For a tutorial on how to transform data by using Azure Data Factory, see Tutorial: Transform data by using Spark. 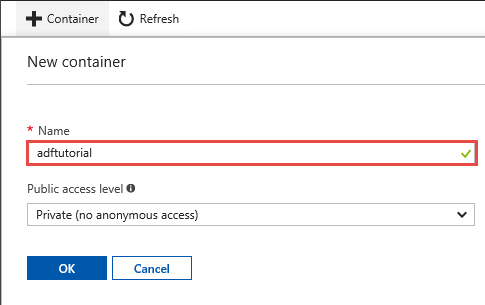 If you are new to Azure Data Factory, see Introduction to Azure Data Factory before doing this quickstart. Launch Microsoft Edge or Google Chrome web browser. Currently, Data Factory UI is supported only in Microsoft Edge and Google Chrome web browsers. 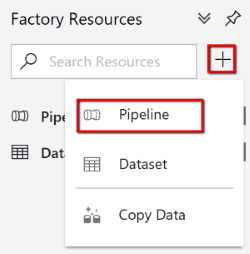 Select Create a resource on the left menu, select Analytics, and then select Data Factory. On the New data factory page, enter ADFTutorialDataFactory for Name. The name of the Azure data factory must be globally unique. If you see the following error, change the name of the data factory (for example, <yourname>ADFTutorialDataFactory) and try creating again. For naming rules for Data Factory artifacts, see the Data Factory - naming rules article. 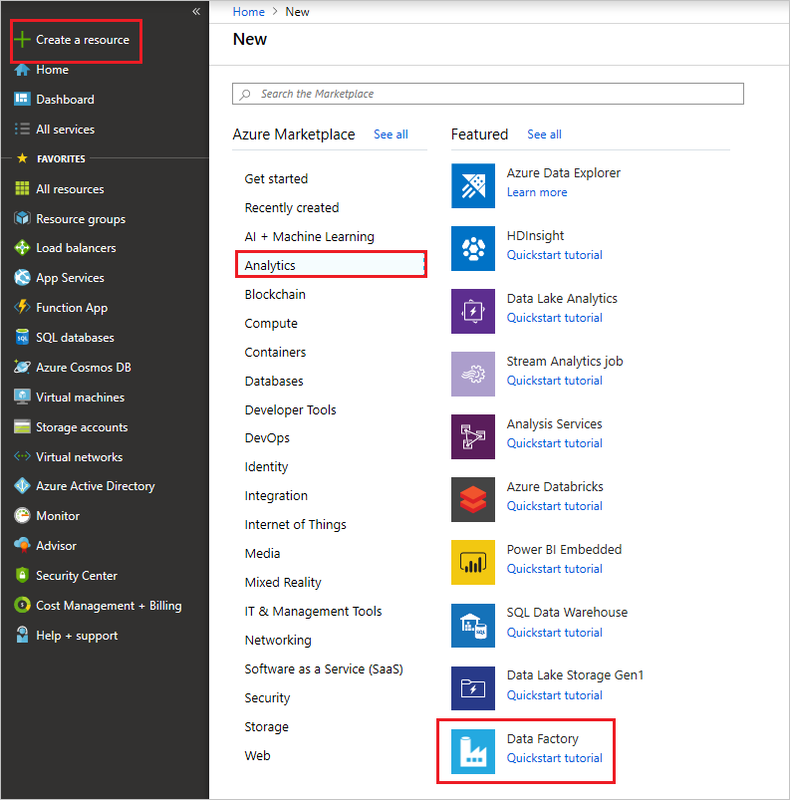 For Subscription, select your Azure subscription in which you want to create the data factory. Select Use existing, and select an existing resource group from the list. Select Create new, and enter the name of a resource group. To learn about resource groups, see Using resource groups to manage your Azure resources. For Location, select the location for the data factory. The list shows only locations that Data Factory supports, and where your Azure Data Factory meta data will be stored. Please note that the associated data stores (like Azure Storage and Azure SQL Database) and computes (like Azure HDInsight) that Data Factory uses can run in other regions. After the creation is complete, you see the Data Factory page. Select the Author & Monitor tile to start the Azure Data Factory user interface (UI) application on a separate tab. On the Let's get started page, switch to the Author tab in the left panel. 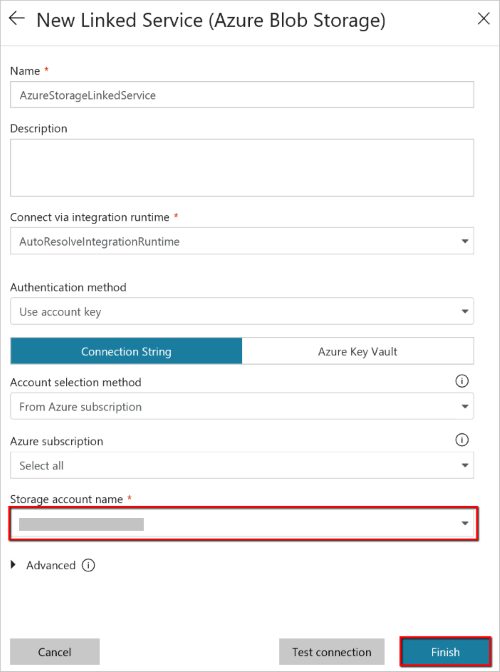 In this procedure, you create a linked service to link your Azure storage account to the data factory. The linked service has the connection information that the Data Factory service uses at runtime to connect to it. Select Connections, and then select the New button on the toolbar. 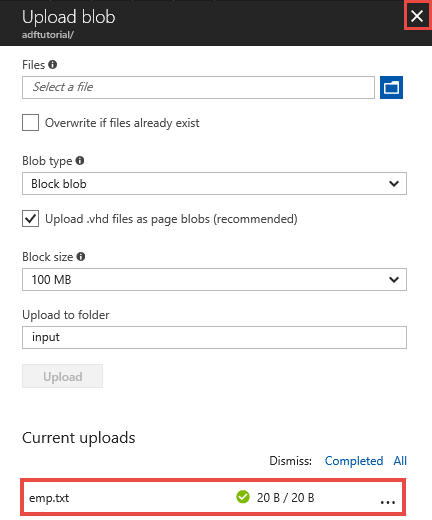 On the New Linked Service page, select Azure Blob Storage, and then select Continue. a. For Name, enter AzureStorageLinkedService. b. 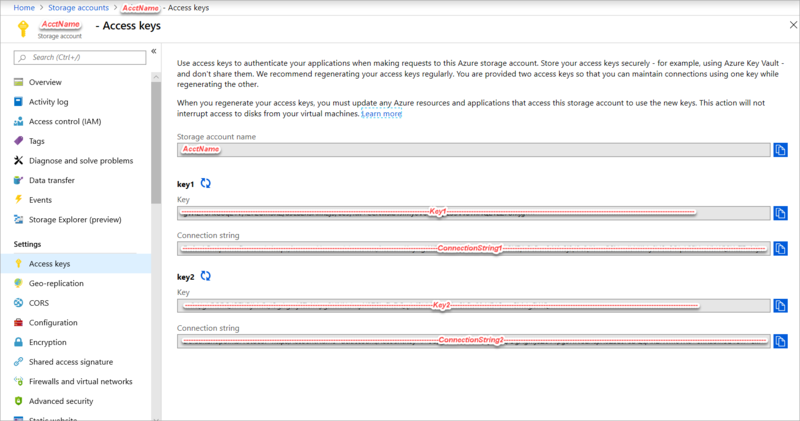 For Storage account name, select the name of your Azure storage account. c. Select Test connection to confirm that the Data Factory service can connect to the storage account. d. Select Finish to save the linked service. In this procedure, you create two datasets: InputDataset and OutputDataset. These datasets are of type AzureBlob. They refer to the Azure Storage linked service that you created in the previous section. The input dataset represents the source data in the input folder. In the input dataset definition, you specify the blob container (adftutorial), the folder (input), and the file (emp.txt) that contain the source data. The output dataset represents the data that's copied to the destination. In the output dataset definition, you specify the blob container (adftutorial), the folder (output), and the file to which the data is copied. Each run of a pipeline has a unique ID associated with it. You can access this ID by using the system variable RunId. The name of the output file is dynamically evaluated based on the run ID of the pipeline. In the linked service settings, you specified the Azure storage account that contains the source data. In the source dataset settings, you specify where exactly the source data resides (blob container, folder, and file). In the sink dataset settings, you specify where the data is copied to (blob container, folder, and file). Select the + (plus) button, and then select Dataset. 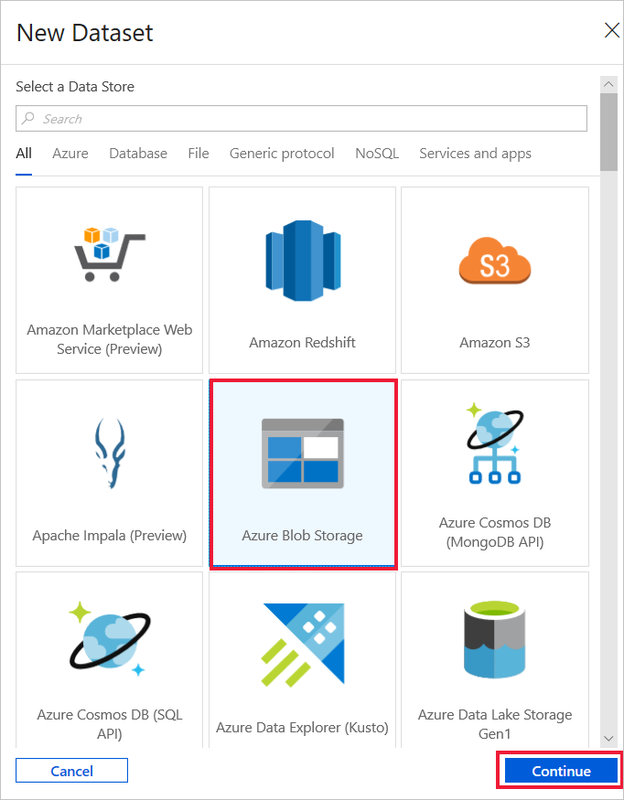 On the New Dataset page, select Azure Blob Storage, and then select Finish. In the General tab for the dataset, enter InputDataset for Name. a. For Linked service, select AzureStorageLinkedService. b. For File path, select the Browse button. 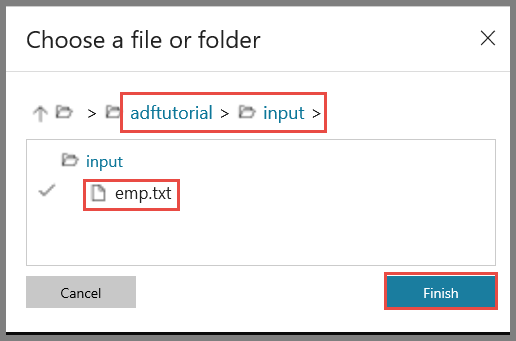 c. In the Choose a file or folder window, browse to the input folder in the adftutorial container, select the emp.txt file, and then select Finish. d. (optional) Select Preview data to preview the data in the emp.txt file. a. Select the + (plus) button, and then select Dataset. b. 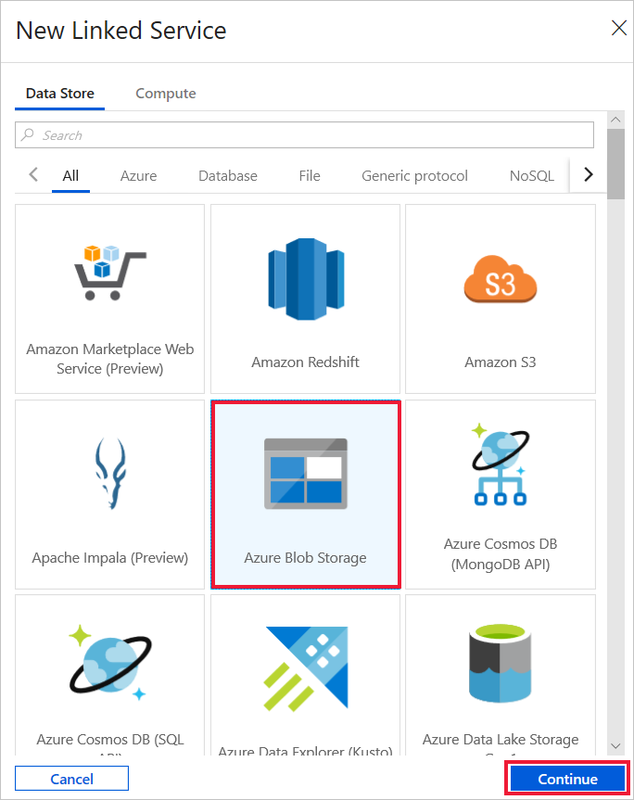 On the New Dataset page, select Azure Blob Storage, and then select Finish. c. In General table, specify OutputDataset for the name. 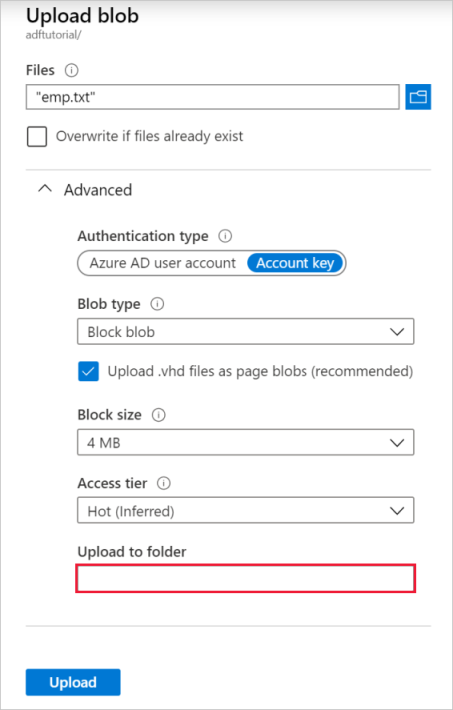 d. In Connection tab, select AzureStorageLinkedService as linked service, and enter adftutorial/output for the folder, in the directory field. 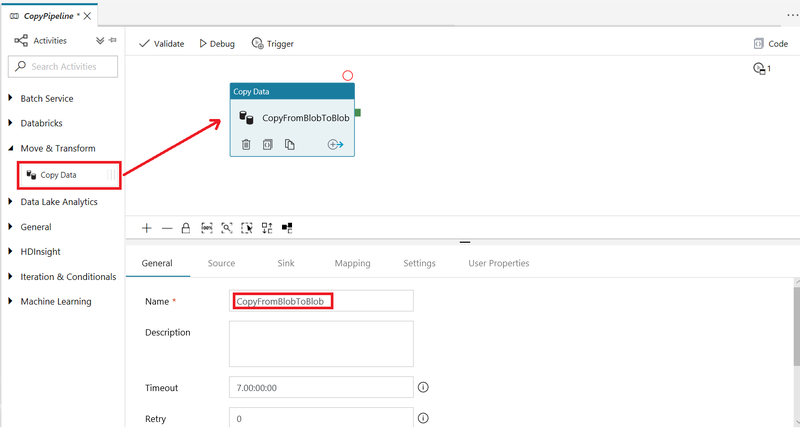 If the output folder does not exist, the copy activity creates it at runtime. In this procedure, you create and validate a pipeline with a copy activity that uses the input and output datasets. The copy activity copies data from the file you specified in the input dataset settings to the file you specified in the output dataset settings. If the input dataset specifies only a folder (not the file name), the copy activity copies all the files in the source folder to the destination. Select the + (plus) button, and then select Pipeline. In the General tab, specify CopyPipeline for Name. In the Activities toolbox, expand Move & Transform. Drag the Copy activity from the Activities toolbox to the pipeline designer surface. You can also search for activities in the Activities toolbox. Specify CopyFromBlobToBlob for Name. Switch to the Source tab in the copy activity settings, and select InputDataset for Source Dataset. Switch to the Sink tab in the copy activity settings, and select OutputDataset for Sink Dataset. Click Validate on the pipeline toolbar above the canvas to validate the pipeline settings. Confirm that the pipeline has been successfully validated. To close the validation output, select the >> (right arrow) button. In this step, you debug the pipeline before deploying it to Data Factory. On the pipeline toolbar above the canvas, click Debug to trigger a test run. Confirm that you see the status of the pipeline run on the Output tab of the pipeline settings at the bottom. Confirm that you see an output file in the output folder of the adftutorial container. If the output folder does not exist, the Data Factory service automatically creates it. In this procedure, you deploy entities (linked services, datasets, pipelines) to Azure Data Factory. Then, you manually trigger a pipeline run. Before you trigger a pipeline, you must publish entities to Data Factory. To publish, select Publish All on the top. To trigger the pipeline manually, select Trigger on the pipeline toolbar, and then select Trigger Now. Switch to the Monitor tab on the left. Use the Refresh button to refresh the list. Select the View Activity Runs link under Actions. You see the status of the copy activity run on this page. To view details about the copy operation, select the Details (eyeglasses image) link in the Actions column. For details about the properties, see Copy Activity overview. Confirm that you see a new file in the output folder. You can switch back to the Pipeline Runs view from the Activity Runs view by selecting the Pipelines link. This procedure is optional in this tutorial. You can create a scheduler trigger to schedule the pipeline to run periodically (hourly, daily, and so on). In this procedure, you create a trigger to run every minute until the end date and time that you specify. Switch to the Author tab. Go to your pipeline, select Trigger on the pipeline toolbar, and then select New/Edit. On the Add Triggers page, select Choose trigger, and then select New. 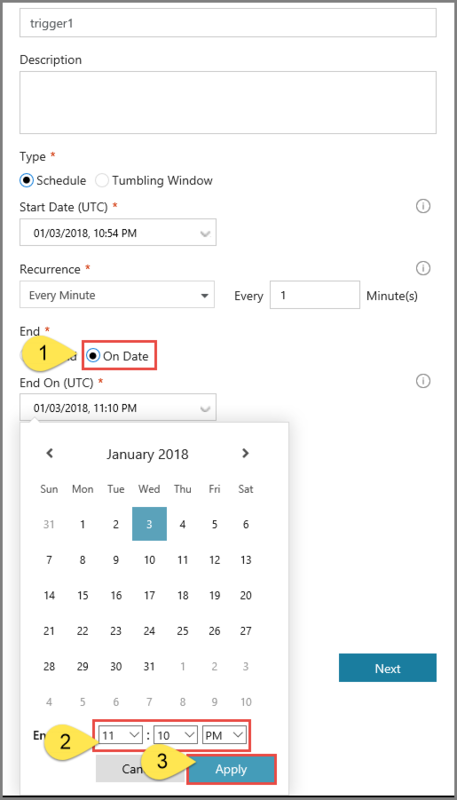 On the New Trigger page, under End, select On Date, specify an end time a few minutes after the current time, and then select Apply. A cost is associated with each pipeline run, so specify the end time only minutes apart from the start time. Ensure that it's the same day. However, ensure that there is enough time for the pipeline to run between the publish time and the end time. 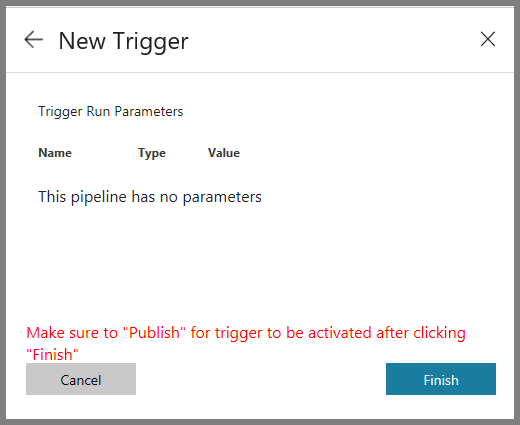 The trigger comes into effect only after you publish the solution to Data Factory, not when you save the trigger in the UI. On the New Trigger page, select the Activated check box, and then select Next. Review the warning message, and select Finish. Select Publish All to publish changes to Data Factory. Switch to the Monitor tab on the left. Select Refresh to refresh the list. You see that the pipeline runs once every minute from the publish time to the end time. Notice the values in the Triggered By column. The manual trigger run was from the step (Trigger Now) that you did earlier. Switch to the Trigger Runs view. Confirm that an output file is created for every pipeline run until the specified end date and time in the output folder. 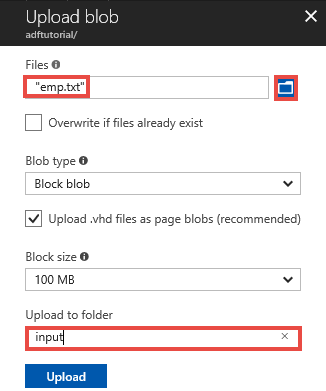 The pipeline in this sample copies data from one location to another location in Azure Blob storage. To learn about using Data Factory in more scenarios, go through the tutorials.